When you first start playing tennis, it can be tempting to grab the most stylish tennis racquet with the coolest colors and be done with it. But choosing the right tennis racquet for you is not that simple! There are certain important considerations to make when choosing a racquet and these are based mainly on your play style and physical strength. Consider these three factors when picking a tennis racquet to help you choose one that suits you the best. The biggest factor to consider when choosing a tennis racquet is your playing style. Different types of racquets are built specifically to enhance certain playing styles and physical builds. There are three main types of racket categories to choose from: lightweight, mid-range powerful control, and ultimate control. (They may be called something different depending on the retailer). If you’re a total newbie, don’t worry about trying to guess what your playing style is going to be. Just go with a lightweight racquet with a large head or sweet spot, and don’t think about it any more than that. (Check our list of the best tennis racquets for beginning players.) Lightweight racquets are suited to amateur players with less physical strength. These racquets help generate greater power from less swing but offer the least amount of control. Powerful Control racquets are considered a balance between power and control and are generally the most widely employed racquet by the pros. If you’ve been playing for a while and can generate some shot power, then this racquet will be perfect. Finally, the Ultimate Control racquet is the heaviest and puts an emphasis on control and touch. Advanced players who use these racquets should be able to generate shot power with their own swing. A standard grip size is 3 or 4 for men and for women 1, 2 or 3, but you may have to engage in trial and error to find your ideal size. When holding the racquet in your hand, you should be able to fit a finger snugly in-between the ends of your fingers and your palm if the grip size is good. Your play style should also impact your grip choice. If you tend to play flat shots a larger grip will help, whereas if you love to use topspin, a small grip will be beneficial allowing you to hit over the ball. 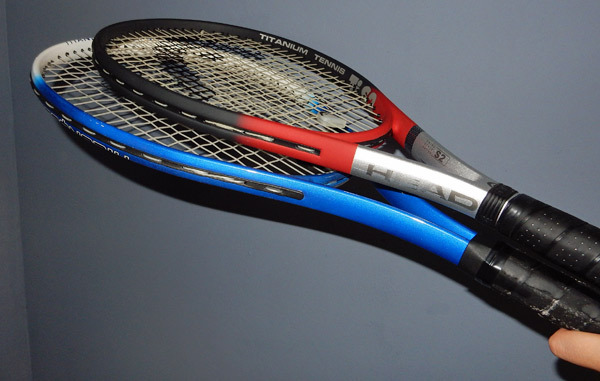 Standard, high-quality tennis racquets will come pre-strung and should have a strong level of tension. Don’t simply stick with the tension that has been applied, however. You can alter the tension to suit your playing style. A racquet with extremely tight strings will allow you greater control over your shots but less power, and alternatively a racquet with looser strings will give you greater power but less control. You can always string your own racquets with a stringing machine if you’re so inclined. While these are three main considerations for choosing the right tennis racquet, choose a brand and a color that are appealing to you as well. You want a racquet that fits your playing style and build, you should also enjoy playing with it and take pride in its appearance and condition. Grab some tennis balls in bulk, head to the nearest court, and get your game in shape!